I’m in love with the avocado toast trend and I have to admit that I’ve been eating this version for a few months and not sharing the recipe. This recipe is so good. It’s easy. It’s filling, and you can change it up any way you want. So why haven’t I shared it? Busyness is my only excuse. I’ve only made this recipe more than a dozen times by now. I could have posted these pics and the recipe 12 times. I’m no longer a horrible person because I’m sharing my current favorite breakfast, lunch, and even sometimes dinner recipe! Start by removing the flesh of the avocado and mashing it in a bowl. Add feta cheese and mix. I left mine lumpy. Add some salt and pepper to taste. Toast a piece of multigrain bread and spread some olive oil on it. You could use butter if you like, but I like the olive oil. Use a good bread here. I bought a great loaf from Whole Foods. It was divine. Top with a fried egg cooked to your liking. This is also great with a poached egg, but the fried egg approach is faster. Add some sriracha sauce and a pinch or two of paprika. Complete the plate with a simple side salad with a vinaigrette dressing and you’re set. I want this right now. You can leave the sriracha sauce off, of course, if you don’t like the spiciness (is that a word?). 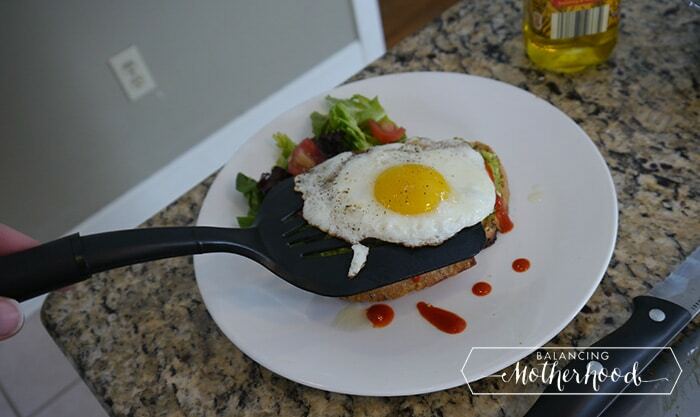 Avocado toast with fried egg. Mix this recipe up any way you wish. Slice and seed your avocado. Remove avocado flesh from skin and place in bowl.